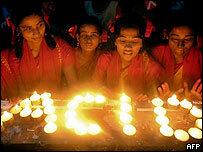 Lawyers in Bangladesh are calling for better implementation of legislation to stop acid attacks. In 2002 the death penalty was introduced for throwing acid after the number of victims rose to nearly 500 a year. There is also legislation to force businesses that use acid to store it safely. But 267 people were still attacked last year and campaigners say it is because the law is ignored. In an intensive care unit, filled with the sound of beeping heart monitors, sits the young victim of a crime so cruel it almost defies belief. 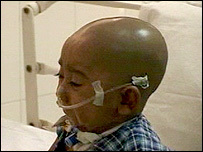 Durjoy was just a month old when he was made to drink acid. A few weeks ago he had heart failure but was revived. He has had a series of operations, and now has to breathe through a hole in his throat. And as the baby boy cries the air wheezes in and out. No one has been brought to justice for the attack - his mother Etie Rani says the motive was a dispute over money. "As a mother I hope nothing like this will happen to anyone else," she said dressed in a green hospital gown against infection, and cradling her son in arms. "I pray to God, 'Please, make my child well and take care of all other children.' Always I feel pain inside me, nothing makes me happy. I feel terrible pain." Acid throwing remains a major problem in Bangladesh. There is even a special hospital and rehabilitation centre for victims in the capital, run by a charity called the Acid Survivors' Foundation. Although some of the patients are children and men, most are young women, like Asma Akhtar. She has scarring on the side of her face and is blind in her left eye. "When I was... 12 years old, a boy from my village wanted to marry me but as I wanted to study my family refused his proposal," she said. "And a year later he threw acid on me out of anger. On that fateful day I was sleeping on my bed and my father went to pray and the culprit took his chance and threw the acid on me." Attacks by spurned men are all too common. "Beauty is perceived as the asset of the girls and young women," said Monira Rahman, the director of the Acid Survivors' Foundation. "These men want to take away the beauty and therefore they will become useless for the rest of their lives. No one will marry them." In 2002 Bangladesh introduced very tough laws to try to stop acid throwing, including the death penalty in the most serious cases. And there are regulations on the sale, use, storage, import and export of acid. The number of people attacked has fallen from a high of nearly 500 in that year, but still, in 2005, according to the Acid Survivors' Foundation, 267 people had acid thrown on them. Campaigners say it is because the corrosive substance is still widely available. Old Dhaka is the heart of the capital - a warren of old crumbling buildings and winding streets, just wide enough for two cycle rickshaws to pass each other. Many people make their living from traditional trades. Some chip at small plates of marble making nameplates, others carve bangles from conch shells, worn by Hindu women to signify marriage, and still more work as goldsmiths in the area's many small workshops. They are crammed into rooms in dark buildings, with water dripping from floor to floor, fifteen or more working in an area three metres by four. Sitting cross-legged at small wooden workbenches they make jewellery by hand. Candles are used for heat; the flame is blown with a pipe in the goldsmith's mouth onto the metal to melt it into moulds. The acid comes in at the polishing stage. It is used to remove discolouration from the finished products. Many jewellery shops flout the law intended to stop acid falling into the wrong hands, as do tanneries and other industries using it. And campaigners say they are getting away with it. "The law is just like a dead law," said Salma Ali of the Bangladesh National Women Lawyers' Association. "Most of the time in our country our government, political leaders are crazy for making a new law and they think this is success." But she says it is much harder to get politicians to implement legislation. Salma Ali says the law should be reviewed to make it more effective. Almost every day at the Acid Survivors' Foundation brings a new victim of another brutal attack. The latest was a middle aged man whose shoulder, chest and leg were marked with a red raw splash. As a patient with a scarred face looked on sympathetically he sat on his bed, silently, tears trickling down his face.